What makes a good online shopping experience? Well-designed and easy-to-navigate sites are important factors. An excellent search function also allows your customers to find what they’re looking for quickly. Alone these things surely guarantee sales, don’t they? If that is the case, why are so many shopping carts being abandoned? A study by the Baymard Institute shows that, on average, a whopping 68.53% of carts are abandoned, which equates to $3 trillion worth of online merchandise being abandoned online every year. So, what can retailers do to stop this from happening? 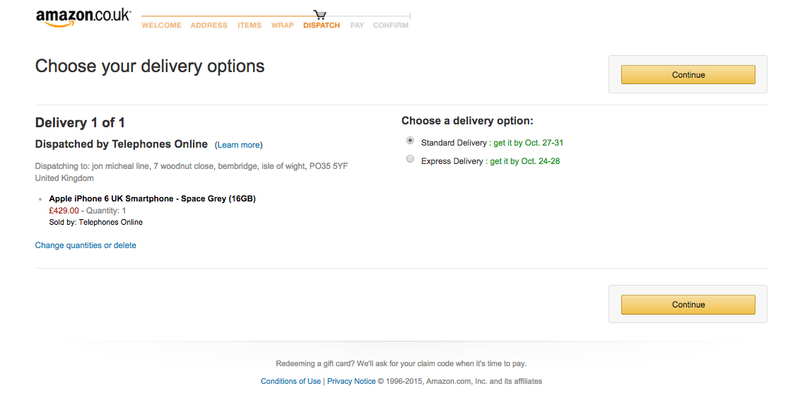 How does the checkout experience need to change in order to bring the cart abandonment rate down? 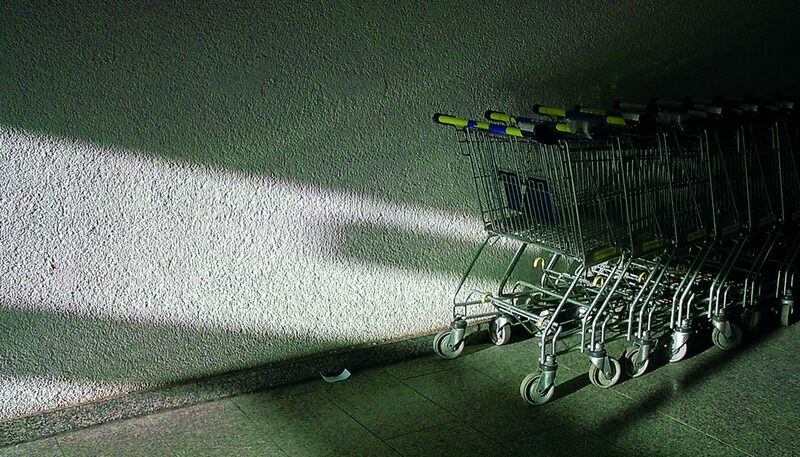 Why does cart abandonment happen? There are several reasons for this, the top being a lack of information surrounding shipping, which is when purchase totals become more than expected because delivery prices aren’t properly displayed until the final checkout stages. Another reason is that people often use their carts to compare prices between retailers. Options for quick checkouts are often negated by retailers, but this isn’t advised, because making customers create an account before a sale is finished can increase the chances of abandonment. Below is a graph created from BI intelligences research in to the major causes of cart abandonment in America. 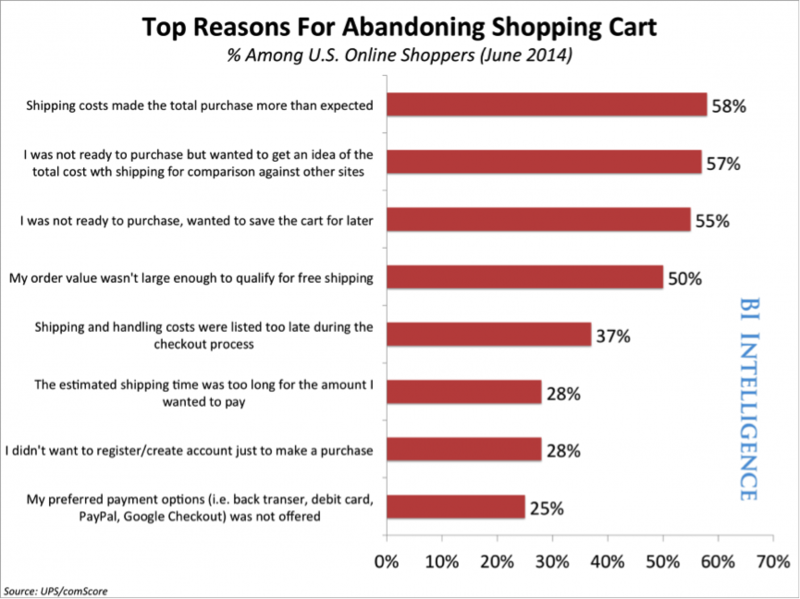 What can retailers do to lower cart abandonment? Most people want to just buy their product and be done with it. Getting people to register is great for your business, but it can lead to cart abandonment. Why not give them the option of registering once the purchase is complete? They’ll hopefully be happy enough with their experience and therefore be more likely to sign-up because of it. No one likes filling out forms, so keep everything simple. Only ask for key information, such as the person’s name, contact details, card information and a shipping address. Over-complicating a form can be a big reason for people abandoning the transaction process. If the customer fills in a form incorrectly, or not at all, make sure the error is glaringly obvious to them. No one wants to spend time trying to understand why they can’t proceed, and eventually they’ll leave. 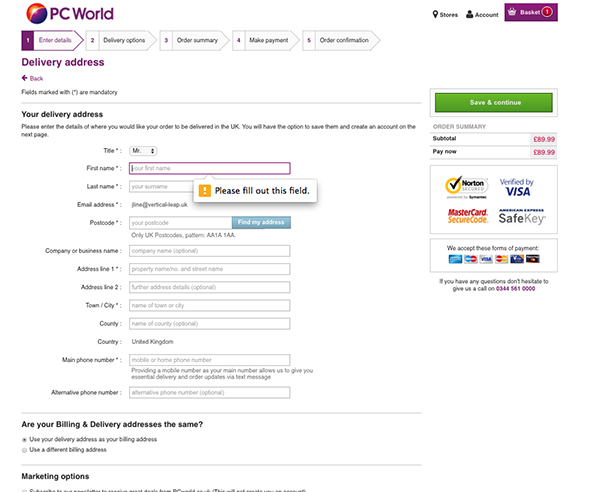 Give the customers reassurances by displaying security features on all pages during the checkout process. Show which payment services you provide and add reputable trademarks of any well known affiliates. Although the customer may not understand all this information, they’ll understand the word ‘secure’ and any well known brands with which you are associated. Adding trust signals like these has a big effect on the checkout process. Remove the navigation (but leave a button to allow them to ‘continue shopping’), side widgets, and anything else that can distract the customer. The only thing they need to see at this stage is a summary of their items, guest and login details, and the shiny checkout button. Something as simple as this allows the customer to get an idea of how long the purchase process should take and how far along they’ve progressed. Ok, now we’ve got some best practices in place, lets take a look at some companies who use them effectively in their checkout systems. The UK-based department store offers a simple, user-friendly checkout system that keeps the customer focused throughout the process. Its online sales now account for quarter of the overall company sales. In 2013, John Lewis saw a rise of 44% in online sales on the previous year. Checkout separated from the main site offering no distractions. Maintains the company brand identity. Contains plenty of trust signals, giving the customer confidence that their details are secure. No need to register to complete a transaction. Simple progress bar allows the customer to track the order process. John Lewis has reduced the process to three stages, making it even quicker. 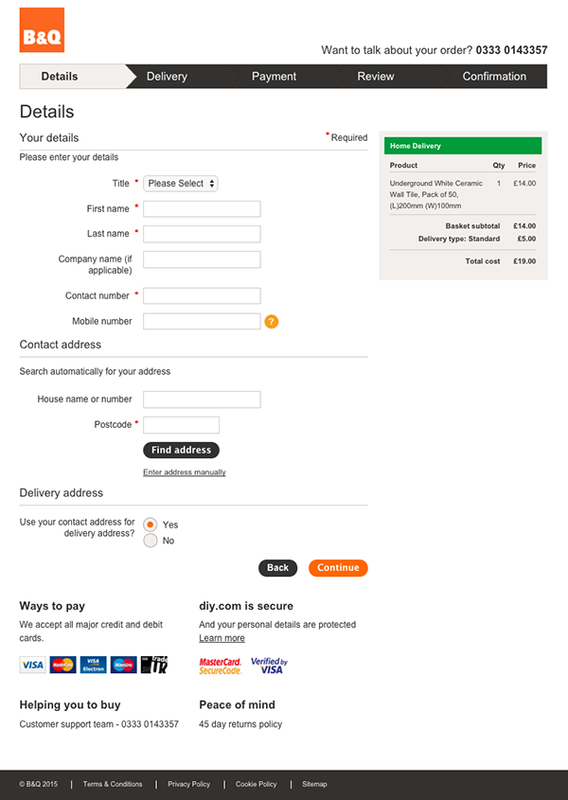 Forms are easy to fill in; even the address needs just the house number and postcode. The checkout system does the rest. But, there’s always room for improvement. Including a summary of the product and shipping costs together throughout the process allows the customer to understand exactly how much they’ll be spending. The UK DIY giant offers a very easy-to-use system, following all of the best practices covered above. This makes for a no-fuss shopping experience. The welcome section offers a guest checkout. The option to create an account is only offered after the transaction. There’s a simple and easy-to-understand progress bar. Trust signals are well displayed on the page. CTAs are clear and well labelled. Form errors are clearly stated, making amendments easy. 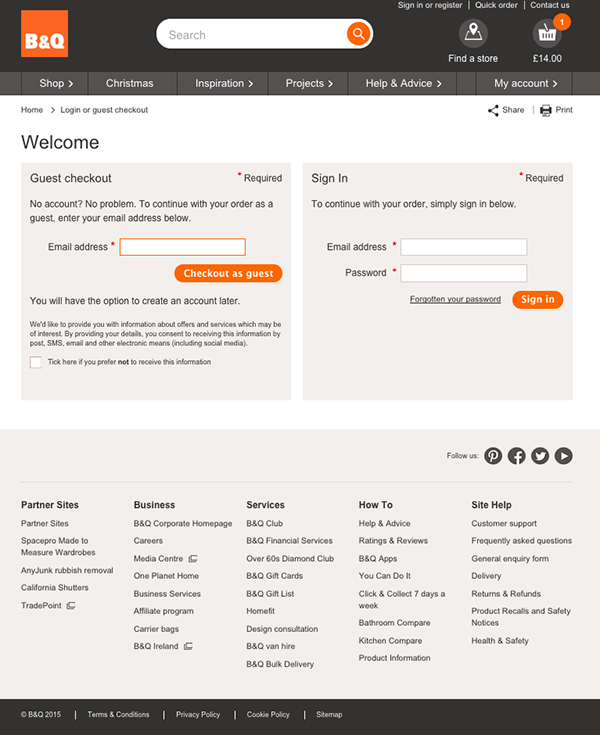 But what could B&Q do to improve the effectiveness of its checkout system? Whilst it follows all the best practices we’ve covered, maybe changing the way the layout works could have an effect on conversions. Lets look at the sign in/registration page to see how it can be improved. This is where A/B experimentation can be invaluable. 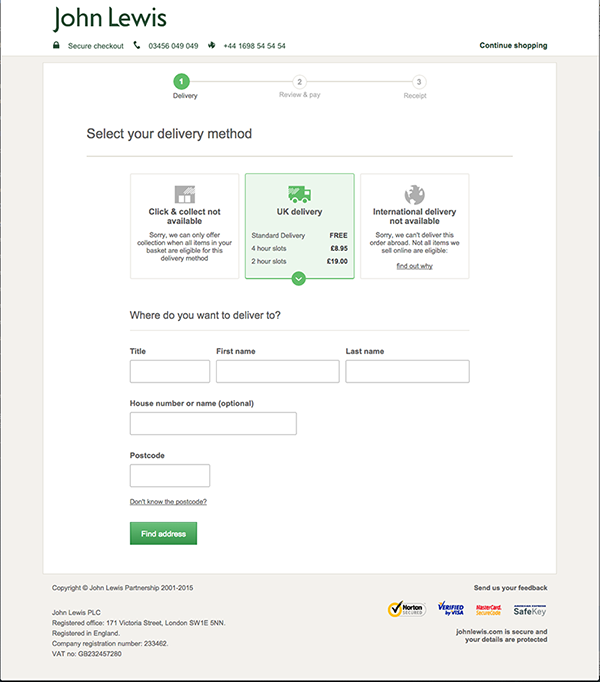 By making changes to the layout of the checkout process, retailers could see a rise in conversions. Take Slideshop.com for example. By addressing insecurity issues, conversion rates increased 15%. 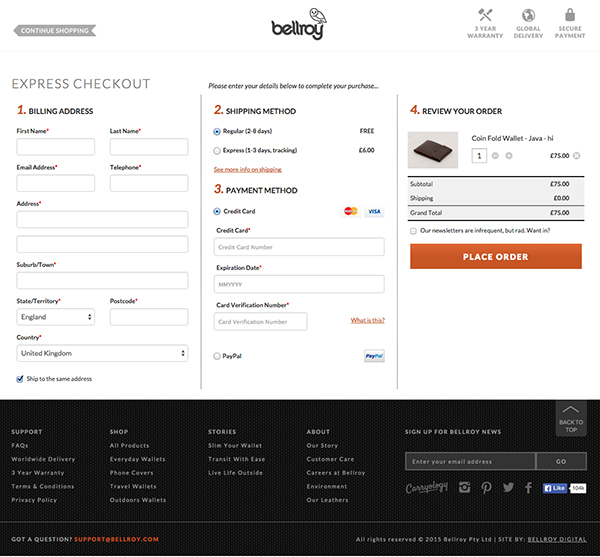 Wallet maker Bellroy has by far the most simple checkout system on this list. Everything is condensed into one page, making the whole process extremely easy. It follows all of the best practices from our list, giving customers a quick and simple buying process. Nicely done Bellroy! Arguably the world’s biggest online retailer, Amazon has a checkout system that is simple and easy to navigate. But, there’s still room for improvement. If you’ve already registered, the Amazon checkout system is quick and extremely easy to navigate. It separates the checkout from the rest of the site, so there are no distractions for the customers. A clear progression bar shows which stage is being filled out. 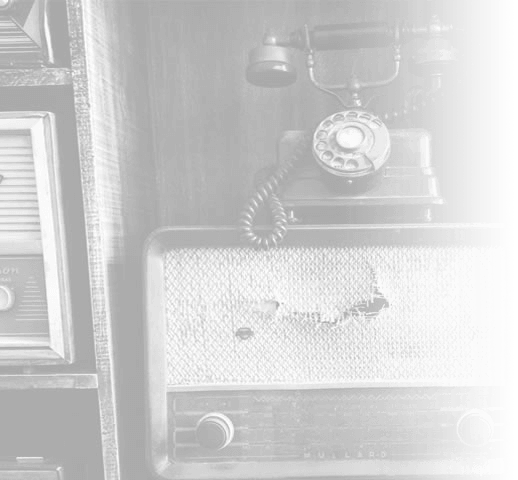 Clear information and CTAs allow the customer to confidently navigate the process. Amazon allows you to save your shipping address and card details, making future transactions hassle-free. The shipping costs are stated before the checkout process starts, making sure the customer has no nasty surprises at the final stages. If you’re a first time customer, however, you’ll need to register. Amazon will tell you an account can be created later, but by this it means straight away. Form errors are displayed at the top of the page. Placing these errors on the fields in which they occurred will aid the customer in amending the error as quickly as possible, allowing them to continue with their transaction. It may not be the highest on the list of cart abandonment issues, but this will certainly have a negative effect on conversions. The technology retailer’s checkout process is clear and well laid out; the progression bar makes it easy for customers to track their progress. Forms are simple to complete with clear error messages, making it easy to amend any mistakes. The CTAs and trust signals also stand out out clearly. Summaries of the product, along with the shipping costs are not clearly displayed until the order summary, though. This means that hidden costs can be incurred further down the checkout process, something that will lead a large majority of people to reconsider their purchase. 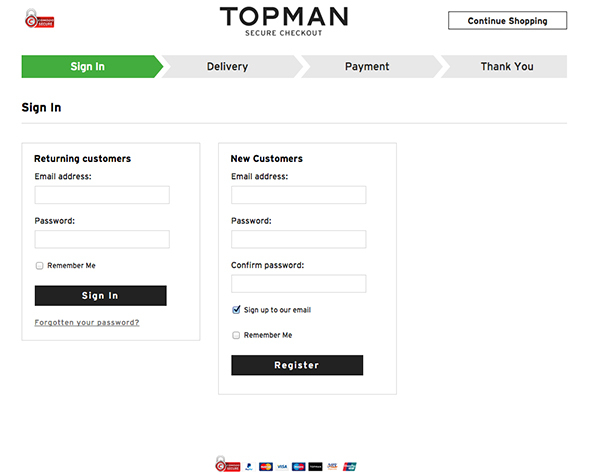 The fashion retailer’s checkout system is extremely simple, leaving the customer with only the essentials to fill in. As a returning customer, the checkout process is simple, with only four steps to complete. As a new customer, registration is required before continuing with the checkout process. The layout is easy to follow, forms are simple and have clear error messages if mistakes are made. The CTAs are clear and trust signals are placed both in the top and lower sections of the page. By carefully considering a customer’s journey through the checkout process and adhering to just a few simple best practices, retailers can see a noticeable increase in conversions. Of course, there are many other things that can be done to help aid conversions. For example, offering comparisons on site can help customers reach a decision without needing to leave your site to compare their baskets (one of the biggest cart abandonment issues). 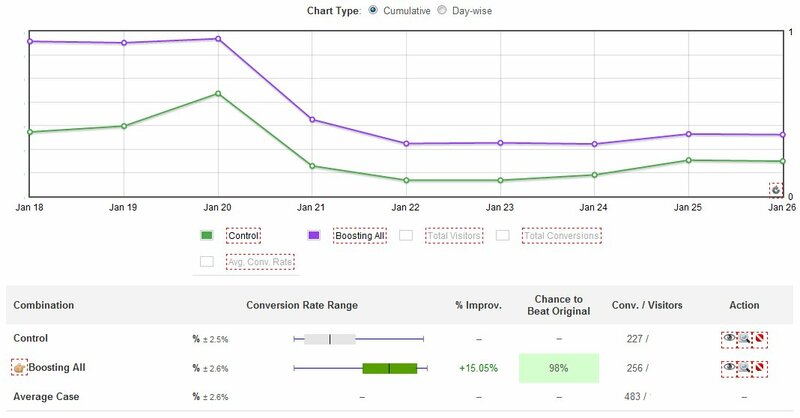 A/B testing allows you to contrast and compare your checkout process. In doing this, retailers can get clear data showing that, by simplifying the checkout process, cart abandonments will decrease. Design ROI: Is your business looking good?